That was Rowena’s cue to step in before Edgar became so upset that he ate one of the birds. Or worse, threw up in one of her shoes. Again. “Edgar!” Rowena sang his name, “Won’t you be a dear and help this poor creature –” Rowena looked at Fiona, no, Penelope. “Her name is Chelsea,” supplied Penelope with a weary sigh. “– Chelsea back to the back? She seems a bit dazed. I’ll take care of our newest guests from here. Thank you, dearest,” Rowena cooed to Edgar. Edgar shook himself out and then set Eric and Horatio on the arm of the chair. He chirped at Rowena and then sauntered over to Chelsea. Rowena walked over to the wrens and then flashed back to her bird form. Edgar hissed angrily from the table but continued to groom Chelsea. Edgar bristled and started growling. While Penelope and Rowena reviewed the data Rowena had collected, Edgar stretched languidly in his chair. Horatio and Eric were still flitting around the room in a frenzy. Their panicked flight path brought them closer and closer to Edgar’s chair. Before either bird realized how close they were to the big-face cat, Edgar deftly jumped mid-air between both birds and gently snatched both birds in his paws. “Hmph. Chelsea learned all her moves from me, you know,” Edgar told the birds. Eric and Horatio were so stunned, they froze. Horatio found his voice first. “What’s a Chelsea, Big Face? “S-s-sorry Big Fa- M-Mr. Big Fa…ce? We don’t know your name. You were just…a face…we saw in the glass…and your face was…(big)…” Eric trailed off as he realized his explanation was making the not big face angrier. Horatio and Eric Exchanged confused expressions. “But everyone knows cats aren’t real!” Horatio blurted out. “Chelsea, please!” Edgar implored. They had both nestled into Edgar’s favorite chair, favoring the worn tweed to the slippery leather sofa. “Wha? Wha’d I do?” Chelsea looked around the room absently. “Your tongue!” Edgar felt helpless trying to train this ridiculous creature. With a flash of sterile fluorescent light, the door leading to “the back” swung open. Dr. Glyndor’s silhouette filled the doorway. She slowly approached Edgar and Chelsea, taking care not to alarm them. She carried the usual metal tray filled with pointy needles and small shiny glass vials filled with foul liquids. Edgar bristled at the sight of her. Although she gave him grief, Chelsea was still his ward. At that very moment, a clicking noise caught the attention of all three. Edgar’s birds! The teeny tiny one was pecking at the glass of the window. Before Edgar could stop her, Chelsea was on the table, deftly turned the lock and slid open the window. She stuck her arm outside and scooped all three birds into the room and closed the window, locking it with a click. 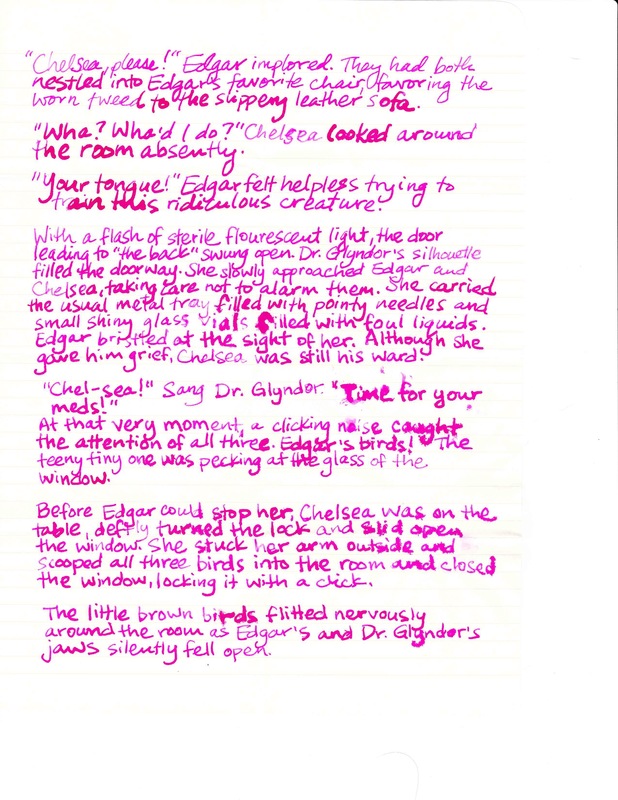 The little brown birds flitted nervously around the room as Edgar’s and Dr. Glyndor’s jaws silently fell open.